I have been so busy and I just have not had the gumption to get around to writing up posts. I finally got a little reprieve thanks to a canceled class and felt caught up on life enough to make time for a little blogging. 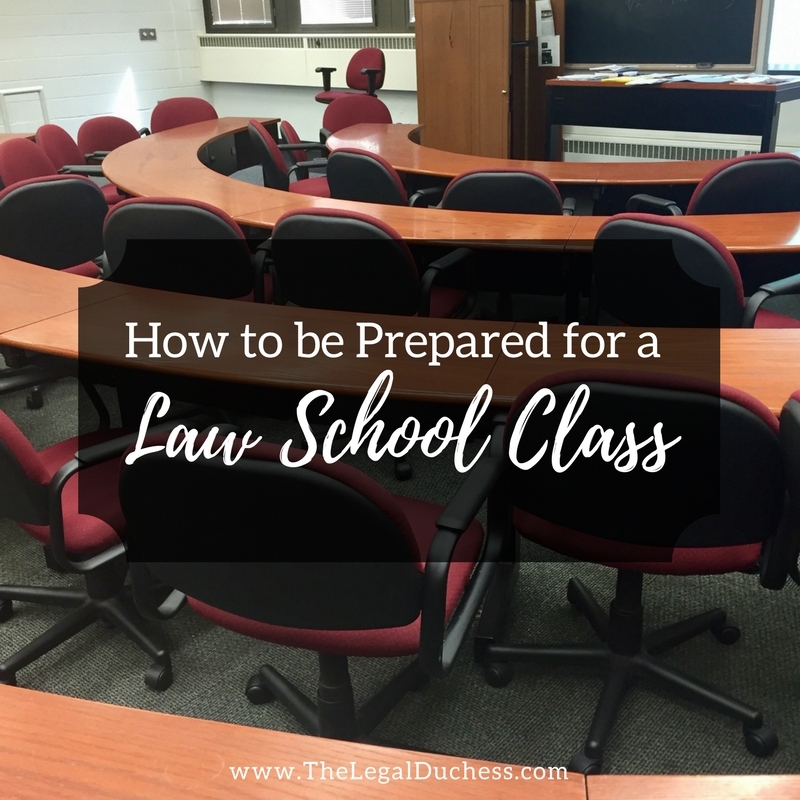 Today's post is all about how to properly prepare for a law school class. It is so different from how I prepared in undergrad. My class preparation in undergrad was something along the lines of skim the assigned reading, pack the book, a notebook and pencil bag in my bookbag and show up to class. That was it and it was good enough to get me through a majority of my undergrad classes. When I hit law school, class preparation took on a whole new meaning: reading the assigned reading multiple times, taking reading notes, doing additional outside research, typing case briefs, packing my bookbag until it almost burst... law school class prep was a whole new world. Now halfway through my third semester of law school, I finally feel that, through lots of trial and error, I have perfected a class preparation that works perfectly for me. It may not work for everyone but this is my method and maybe it will help you to develop your own method. I have a binder for each class. I take all my notes on reinforced loose-leaf paper organized within the binder and I also add any additional class papers to the binder: syllabi, powerpoints, handouts, practice questions, etc. The night before class, my bookbag will be packed with my class binder, casebook, my planner, my pencil case (filled with my favorite Uniball Gel Pens), laptop and laptop charger. Something everyone thinking about law school or starting law school has heard a hundred times is always always always read for class. I will echo that- I always read before class except for the rare occasion when I am sick or crazy busy when I will still do a skim of the reading instead of reading it deeply. I never want to go into class without an inkling of what we will be covering. My process for reading for class is to read each case straight through once to get a just of it. Then I skim back through it, pulling out the important bits and I write those down in my reading notes. Sometimes, if I am really struggling to get the point out of a confusing case, I will look up a case brief online to help me identify what is important. I do that rarely but desperate times sometimes call for desperate measures. I take my reading notes on loose leaf paper in black ink, leaving space on the page to be added to later in class. I also like to get to class 10-15 minutes earlier to skim over my notes once more before class starts so that if I get called on, I am ready. This may seem a little weird but in the spirit of full disclosure... I make sure to never go to class on an empty stomach and I keep a few granola bars in my bookbag just in case I get hungry. I have trouble focusing when I am hungry so I avoid that at all costs when I am in class. Also, I make sure to have a full water bottle- it drives me nuts when people leave in the middle of class just to go fill up a water bottle. I also bring coffee to my morning classes because otherwise, I would fall asleep. I keep peppermint gum in my bookbag at all times because I think it helps me think. Additionally, I have trouble focusing if I am too cold. Our school tends to run on the cold side so I am always dressed in layers and sometimes I even carry a blanket. I refuse to let something as preventable as being cold keep me from focusing to my full potential. Also, full disclosure, I use the restroom before every class. I have a small bladder and I hate leaving in the middle of class just to use the restroom and potentially missing good information. I try to eliminate as many distractions, stressors, annoyances, etc. to ensure that I can focus and get the most out of my classes. When I am in class, I keep my casebook, binder, pencil case, and planner on the desktop. On our tiny little desks, that is all I have space for and that is really all I need. I do not take computer notes so I leave that in my bookbag. I always have my casebook open to the page we are covering for easy reference and I have my reading notes on one side of my binder with a blank sheet for class notes on the other side. I take all my class notes in a different color than reading notes- this way when I am looking back at my notes, I know exactly what the professor said in class in comparison to what I got out of the reading and I can ensure I am getting the correct information in my outline. I keep my bookbag and purse under the desktop by my feet and I leave my phone zipped inside my purse to avoid distractions. You have seen all the actions I take to avoid any distractions that would keep me from focusing in class. Therefore, when I am in class, I try to be in it 100%. I listen, I take notes, I participate when I have something compelling to say. It is easy to zone out during class so I make a constant effort to stay engaged. I am not saying I am always perfect- I have been known to write my grocery list in my head during Constitutional Law every once in a while but I do try my hardest to avoid that and stay focused on class information. I hope this helps new law students to form a method of preparing for class that works for them. It certainly takes a little while to determine what works for you and what is the best process. Once you get it figured out, it takes a lot of the stress out of law school because you know what to do and you just have to sit down and do it. Happy studying! Enjoy your weekend!